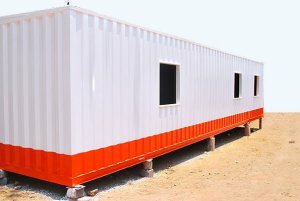 Valisons & Co are the leading manufacturer and suppliers of Prefabricated Units / Buildings / Houses throughout India. The conventional method of building a structure is to transport bricks, timber, cement, sand, steel and construction aggregate, etc. to the site, and to construct the houses on site from these materials. In prefabricated construction, only the foundations are constructed in this way, while sections of walls, floors and roof are prefabricated (assembled) in a factory (possibly with window and door frames included), transported to the site, lifted into place by a crane and bolted together.